A while back I took a poll in the PMT Challenges Facebook group asking what questions they had about summer style. One of the most asked questions was about summer completer pieces. 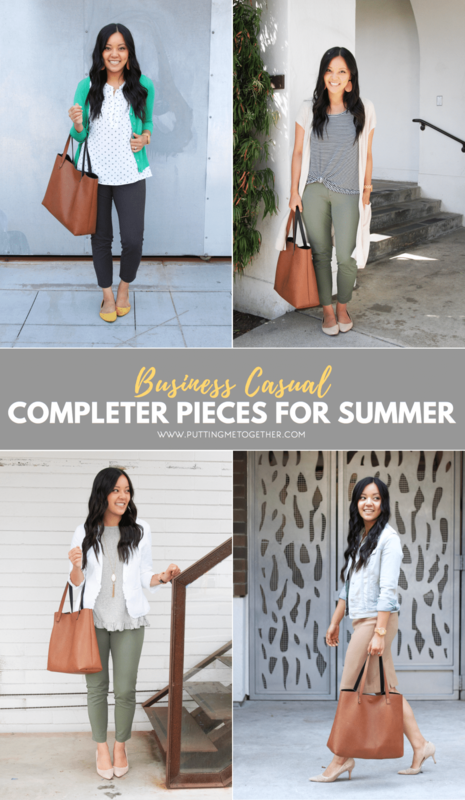 Last week I posted 5 Completer Pieces for Casual Outfits, and today we’re talking business casual completer pieces! One question I get often–very often–is, “What if it’s too hot for completer pieces?” I answer that in the 5 Completer Pieces for Casual Outfits post. It seems to be a more relevant question for casual outfits as opposed to business casual outfits where you’ll likely be in an air conditioned building. Many women said they’re cold indoors and need at least a light layer, but they’re sweating and need to shed a layer when they walk outside. In the summer I try to make outfits *not* rely on completer pieces to look, well, um…complete. 😀 The outfit needs to work with AND without the completer piece in case you need to shed that layer. 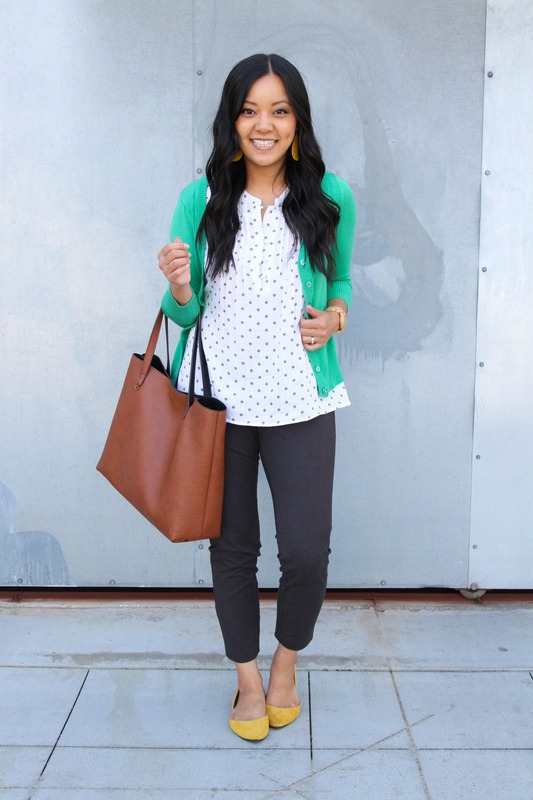 Here are a few lightweight options for summery business casual outfits! SIZING: I’m 5’6″ and usually 6/8 or S/M in clothes, 8.5 to 9 in shoes. I’ve shared this blazer before, showing how to wear it for Work & Play, and it really is a fantastic option for summer business casual. First, a lighter color feels more summery. Second and more importantly, this is lightweight. Blazers can be thicker and heavy which do not feel great for summer, but the one above is a linen and cotton blend which makes it lightweight and great for summer. If you can’t find a lightweight blazer but want outfits to feel summery, at least go for ones in lighter colors like light grey, pale pink, beige, and white. 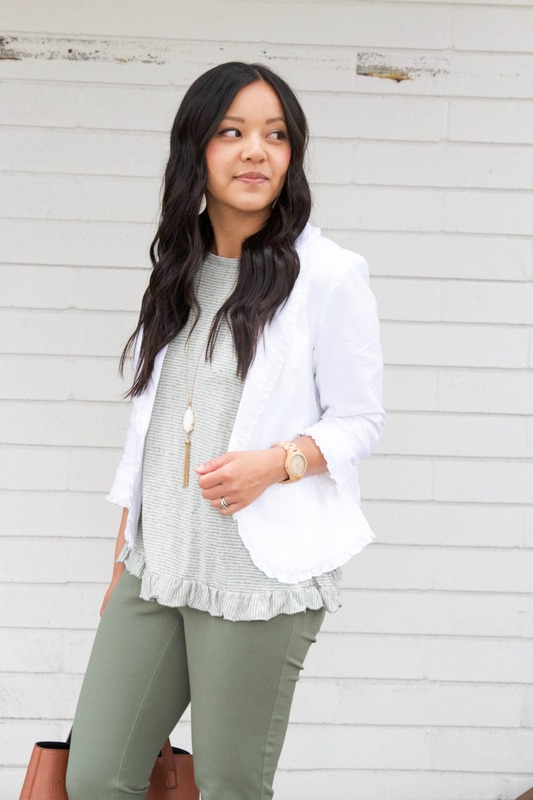 I have these cardigans in SO many colors, and bright ones help transform an outfit of neutrals into a fun, summery outfit. 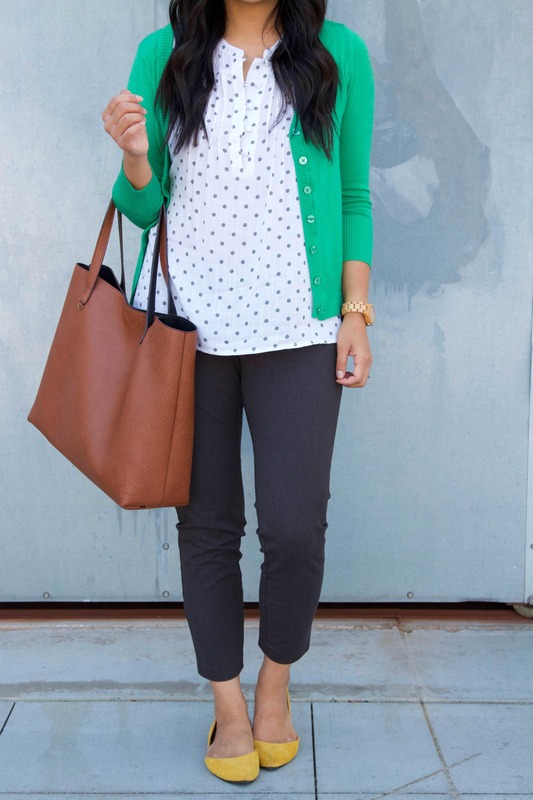 Here, the pants and top are both neutrals, but the add-ons like the cardigan, earrings, and shoes give it life! These cardigans are very soft and come in tons of colors. Colors rotate in and out depending on the season. I wear them in size M. See all the current colors HERE. Also, I was asked a lot about this top on Instastories but it sold out super quickly. However, I just saw a VERY ADORABLE mustard one with white dots is now available! See it in sizes XS to 4X HERE! I showed this among 5 Completer Pieces for Casual Outfits styled with denim shorts and a tank, but you can wear it for a casual business casual outfit too! They’re really nice if you want to wear a tank top when you’re outside but don’t feel like a tank top is appropriate for your office. You can cover your shoulders with a short sleeved cardigan, then take it off and be more comfortable in the heat in your tank top! This one is sold out now, but at the bottom of this post there are lots of other short sleeved cardigan options. This might be too casual for some offices but can work in others. 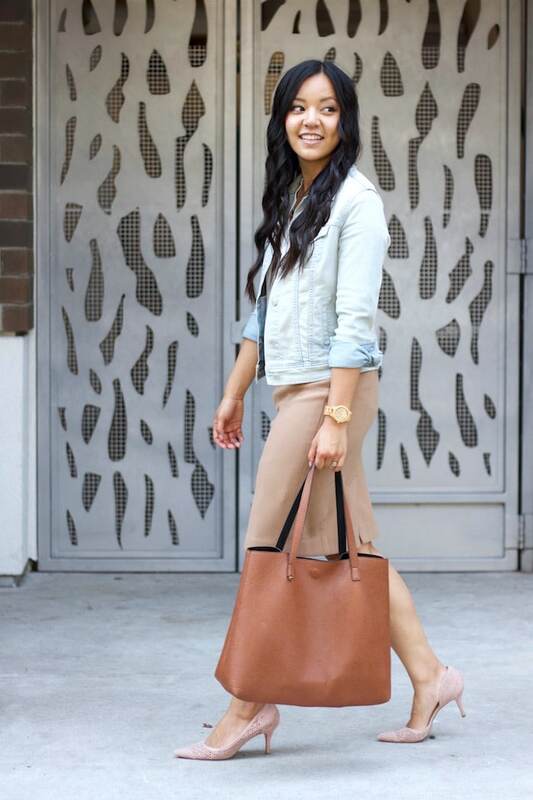 A denim jacket is a great completer piece in the summer, fall, and spring. I love them! I often wear them in casual outfits, but here I paired it with a pencil skirt and blouse for a casual business casual look. If you want help finding a great denim jacket, read my post on What I Look for in Denim Jackets. And if you want to see the many, many, MANY ways I’ve worn this white top, click HERE. 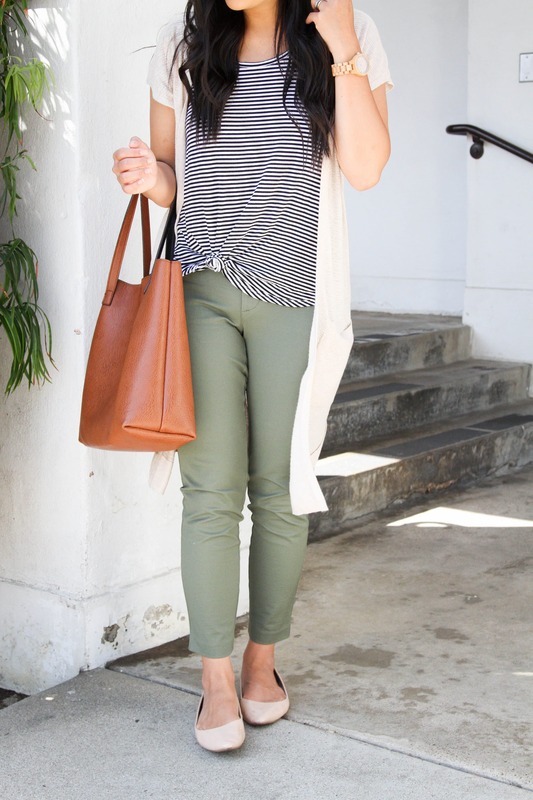 Those are types of completer pieces you can wear to the office during the summer! Get several of them in different colors and you’ll be set all summer. Below we’ve rounded up a bunch more to choose from! P.S. 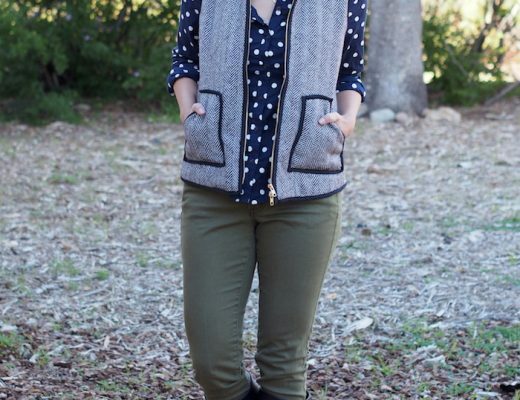 I probably won’t be posting on the blog next week in order to work on the Fall Starter Kit Wardrobe Guide! Might be around on Facebook and Instagram though! You nailed each look! Proof the classic pieces are a must. Plus, I love a good jean jacket! All great ideas! Thank you!